Twitter for Mac version 2.1 was released with some interested changes. The popular Twitter client has some new looks, new functions and the ability to clone windows, among other things. Here’s what’s new with Twitter for Mac 2.1. The UI design has much progress and its good sign to improve the application like this Twitter for Mac 2.1. If you compare with the previous you will found huge improvement, and its not only the display also preferences and scripted. 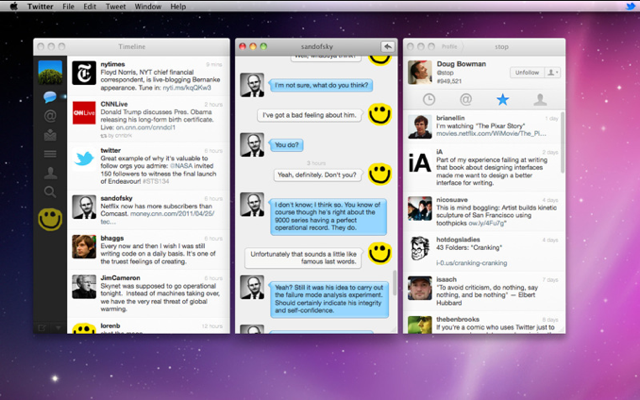 Twitter for Mac can be installed in OSX 10.6 and above. If you have new iMac 21.5″ at home that would be great because this new twitter for Mac 2.1 has new window and history chat, so if you have large screen it will show many window and you can twit chat with many people at once.